Season fish, dredge in flour then fry in heated oil. Drain on paper towels. 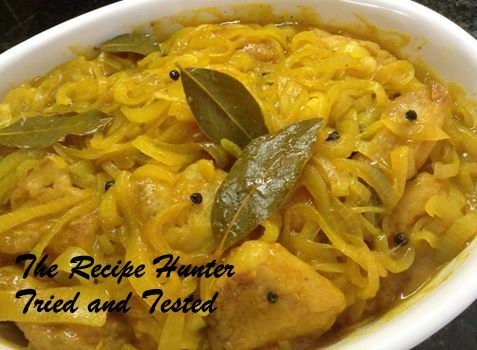 In a saucepan add 2 large onions sliced thinly, 1 1/2 cups white vinegar, 1 1/2 cups water, 1/4 cup sugar, 4 bay leaves, 5 ml salt, 1 1/2 tsps black peppercorns, 4 whole cloves, 1 tsp turmeric, 1/4 tsp ground ginger, 1 tbsp Pakco masala curry powder. Boil on medium heat for 10 mins. Remove and set aside to cool slightly. 4 tsp cornflour ( maizena ) 4 tsp water mixed into a paste. Add to sauce to thicken if required. Layer half of sauce in glass Pyrex bowl, layer the fish then add remaining sauce over the fish. Refrigerate. Can keep up to 1 month in the fridge with a lid on.